This roasted sweet potato salad with maple vinaigrette is bursting with fall harvest flavor! Roasted sweet potatoes, crisp apples, tender swiss chard, and nutty wild rice come together for a hearty, nutritious, and flavor-packed vegetarian dinner. Prepare your grains per package instructions. For the wild rice, I used one cup of wild rice to cups of water with a dash of salt and set the rice cooker. It takes about 45 minutes. While the rice/grains are cooking, roast the sweet potato. Heat the avocado oil in a skillet over medium heat. Once shimmering, add the sweet potato to the pan, toss to coat in the oil, and sauté until browned, stirring occasionally, about 20 minutes. To make the dressing, combine all ingredients in a jar with a lid and shake vigorously until combined. 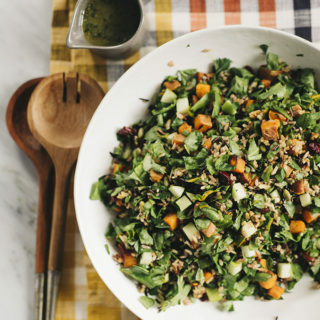 Toss the cooked grains and sweet potato with the chopped chard and granny smith and top with the cranberries, pepitas, roasted pecans, and dressing to taste. Serve warm. Optional: Add a protein of your choice such as pulled pork, roasted chicken, or grilled tofu or a complete meal. Meal Prep (Basic): Reserve dressing and store in single-serving sizes in the fridge, with dressing on the side. Keeps for about 5 days.